Reference archivists at the John F. Kennedy Presidential Library are responsible for answering questions from researchers of all kinds around the world. For those of us who work specifically with the paper collections, our detective work can lead us to look at hundreds of documents every day; after all, finding just the right piece of paper in the roughly 48 million pages in our collections can take a bit of digging. Our reference requests cover a wide range – you can find us working with students to find sources about the Cuban Missile Crisis; showing an Ernest Hemingway fan the (over forty!) drafts of endings to A Farewell to Arms; pointing a current-events follower to Kennedy’s 1960 speech on religion; helping members of the press fact-check historical information; and, of course, assisting scholars as they look for documents about anything from the Bay of Pigs Invasion to the Civil Rights Movement. We’re lucky to have such variety in our work, and to learn something new from these documents every day. A great benefit of that variety is that our reference team regularly stumbles across unexpected gems in the course of our work. Many people would expect to find some of the most significant policy decisions and cultural moments in United States history documented in our holdings. But how many people would be surprised to come across these – some of my favorite unexpected finds in the archives? A President ought not to appoint a Man to office because he is his relation; nor ought he to refuse or neglect to appoint him for that Reason. There would be no Justice to the Individual, to The President himself, nor to the Nation in such a Rule. …Shall he be dismissed, or not employed because he is a Son or a Brother of a President? The Nation has a right to his service. The two Presidents clearly shared some opinions; almost 150 years later, President Kennedy appointed his brother Robert F. Kennedy as Attorney General, and his brother-in-law Sargent Shriver as Director of the Peace Corps. JFKPP-044-002-p0005. 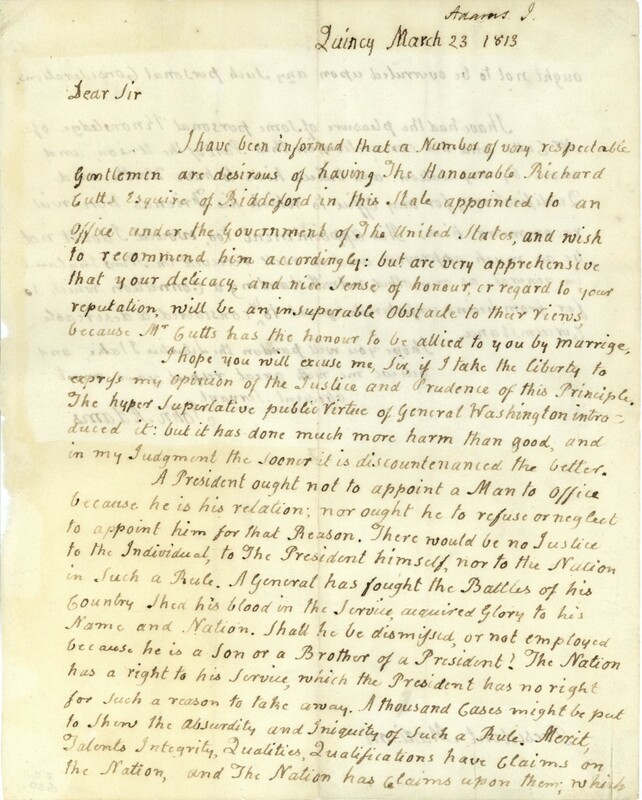 1813 letter written by President John Adams. View entire folder here. Searching for a letter a researcher wrote to John F. Kennedy during the 1960 presidential campaign led me to the “Massachusetts” folders in the 1960 Presidential Campaign Files, where this letter was filed away. 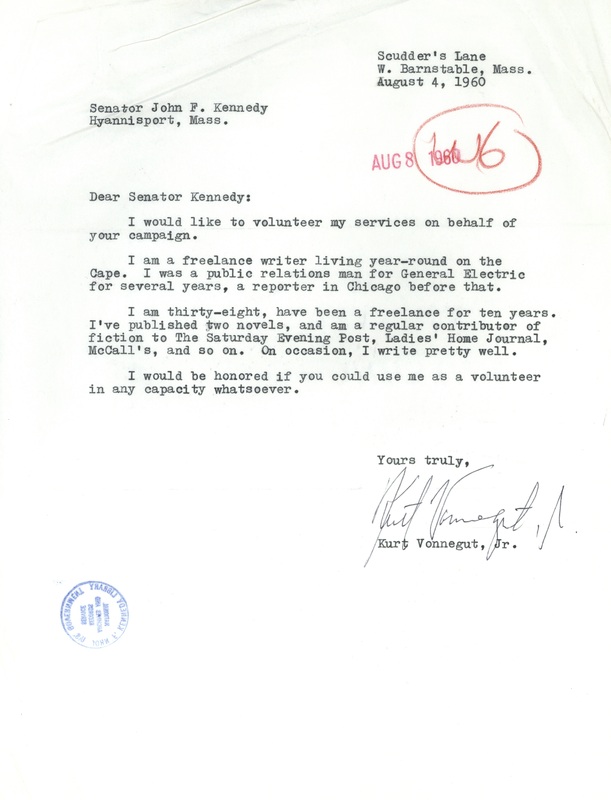 Kurt Vonnegut had recently published his second novel, The Sirens of Titan, when he wrote to then-Senator Kennedy, introducing himself and offering his services during the 1960 presidential campaign. JFKCAMP1960-0982-011-p0003. 1960 letter from Kurt Vonnegut to John F. Kennedy. View entire folder here. Throughout his presidency, John F. Kennedy received many letters from people asking for permission to make him an honorary member of their organization. Assistants would sometimes accept these memberships on the President’s behalf and file the membership cards in the President’s Office Files. I was looking for one of those cards when I noticed this unexpected certificate. 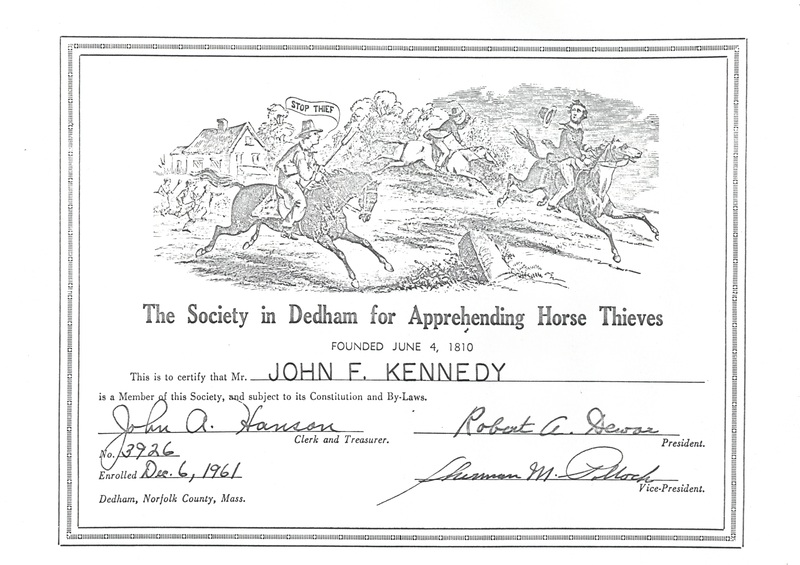 Founded in 1810 and still in existence today, the Society in Dedham for Apprehending Horse Thieves has also given memberships to nearly every President since Kennedy. JFKPOF-131-003-p0017. Society in Dedham for Apprehending Horse Thieves membership certificate, 6 December 1961. View entire folder here. Some other memberships offered to President Kennedy? The National Wildlife Federation, the National Rifle Association, the Washington National Chess Association, and the Bartenders International League of America. President Kennedy produced so many doodles that we have an entire series – well over one hundred folders – of them in his personal papers. 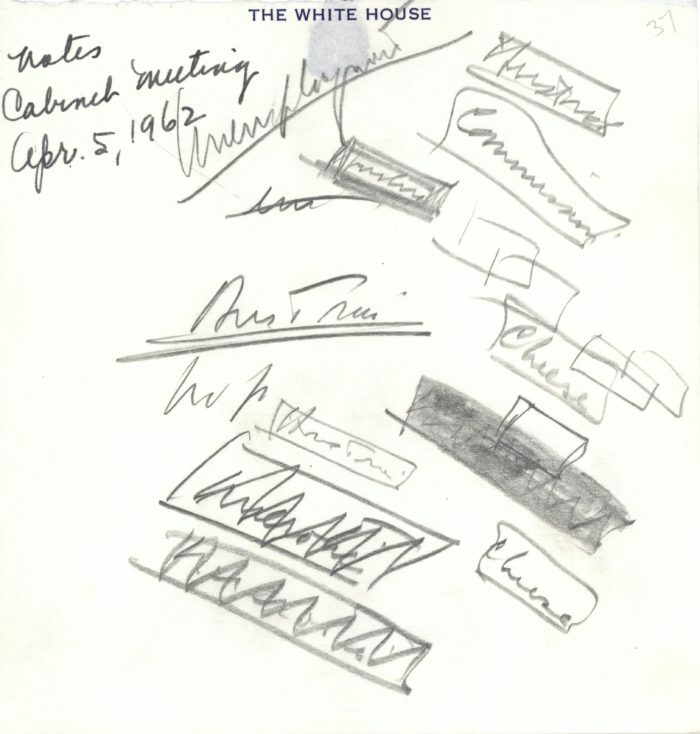 He especially liked to doodle during cabinet meetings and telephone conversations, and we most often see boxes, arrows, sailboats, and single words or phrases repeated several times. The President’s scribbles can be surprisingly revealing sources for researchers, so archivists look through them regularly. JFKPP-042-006-p0021. “Cheese” doodle, 5 April 1962. View entire folder here. A quick look at the agenda for this particular cabinet meeting reveals the topics of discussion: foreign policy, unemployment, emergency planning, and the budget. Given these topics, the words “unemployment,” “Austria,” and “commission” make sense. But we may never know what prompted the President to jot down “cheese” a couple of times during the hour-long meeting, making this document one of my favorites. Working with a literary collection is an unexpected treat for archivists here, where we house the world’s largest collection of Ernest Hemingway papers. One source for interesting Hemingway material is a collection of scrapbooks kept by Hemingway’s mother, Grace. In helping researchers work with them, we’ve found several pages devoted to young Ernest Miller Hemingway’s art. 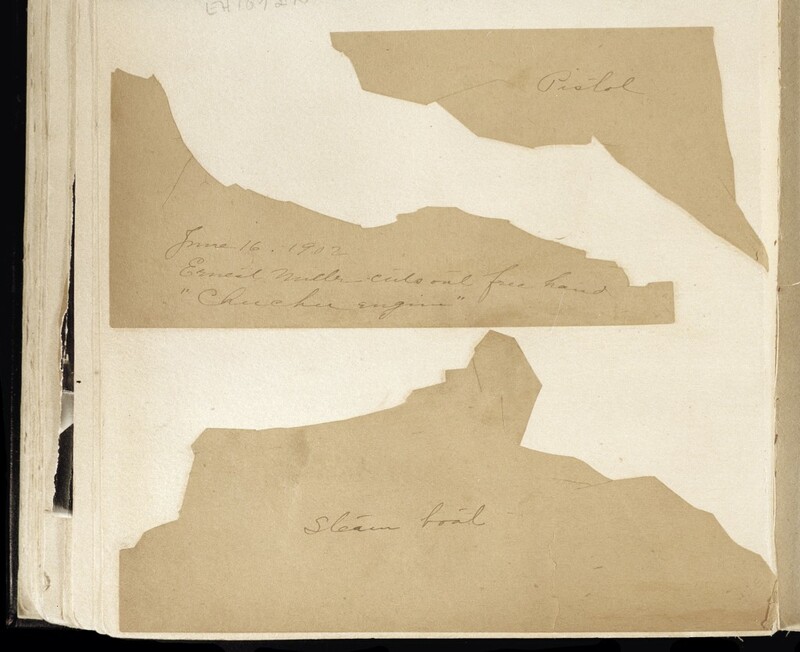 In 1902, a nearly three-year-old Hemingway cut pieces of paper into shapes, and his mother labeled them as he told her what they represented. These unique documents remind us that some of Hemingway’s most enthusiastic pursuits – hunting (“pistol”), boating (“steam boat”), and traveling by train (“chu chu”) – had interested him since childhood. Page from Ernest Hemingway scrapbook created by his mother, Grace, 1902. Ernest Hemingway Personal Papers, Other Materials, Scrapbook II, page 44. JFKPP-039-002-p0023. Note scribbled by John F. Kennedy, c. 1955. View entire folder here. ← Hemingway Pictogram Puzzle Solved! I am a member and always interested in things about President Kennedy. If possible, I would like to be notified of further posts.